Thank you for visiting Nana B's Boutique! Whether you are just dreaming about placing an order or would like to place an order, contact me at Beccie@nanabsboutique.com. I will send you photos of fabrics by color or theme. (I have hundreds that are not posted on this website) I can then do a mock up by laying out the fabric you are considering with embroidery and rhinestone design and trim options, etc. to help you envision your tote. We will take all the time needed to do this because your tote will last you for years to come and we want to help you get everything you want. 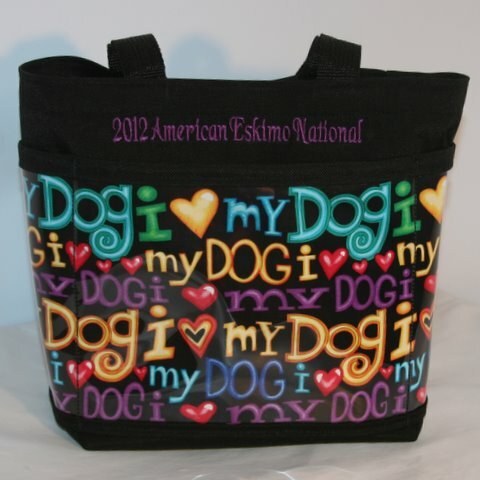 Once we have the information on how you would like your tote to look, I will send you a quote. From there, whenever you are ready to place your order, you let me know and I can then send an invoice via PayPal, or you can call with credit card information or send a check. I do require payment prior to tote construction. NOTE: All totes are handmade with 1000 nylon denier cordura fabric. 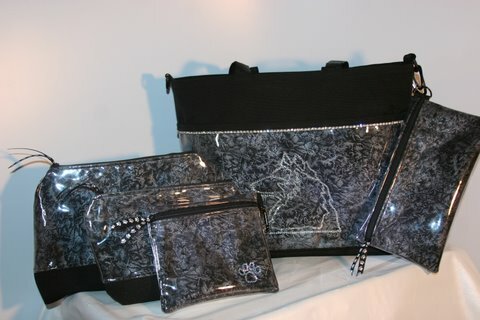 Marine grade, UV protected vinyl covers all decorative fabric, providing a quality moisture resistant tote! Simply wipe clean with a damp cloth! Inner rigid reinforcement ensures the sides don't sag or collapse. Each of the 5 inside pockets have a 'front' pocket with a closed bottom to hold smaller items, keeping everything in view for quick, easy access at ringside. Durable poly webbing straps are triple stitched to ensure maximum strength. Each tote has a D-Ring & carabineer outside to clip your car keys, lead pouch/coin purse or other items. 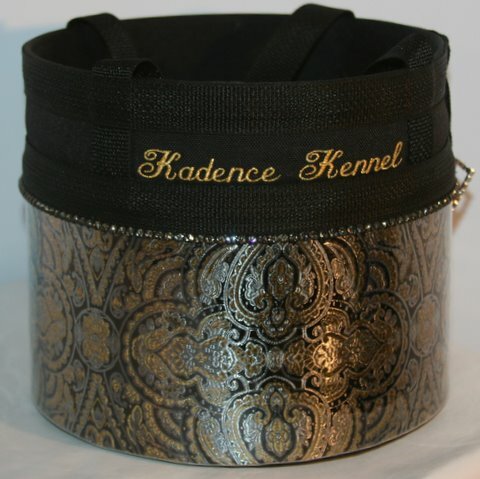 Height: 8" Circumference: 30" Diameter: 10"
ACCESSORY BAGS TO ACCENT ANY Nana B's Boutique TOTES! 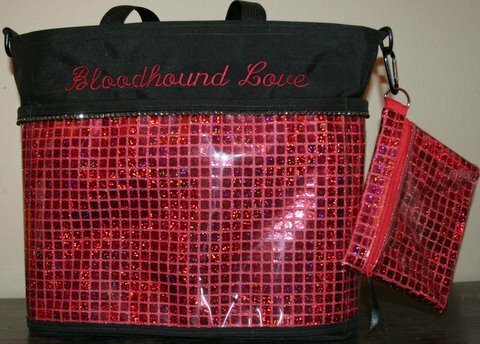 Lead Pouch/Cell Phone: $20.00 Size: 7 ½" x 5 ½"
Make-Up Bag $22.00 Size: 7" x 10"
Large Make-Up Bag $28.50 Size: 12 ½" x 8"
Scissor Bag $20.00 Size: 5" x 10"
This 'no topple tote' (will not fall over when set down even when empty) provides 4 outer pockets, 8" wide on front & back, 4" on each side. Rigid ABS plastic bottom supports items needed at ringside & can be removed when not in use to allow the tote to be gently folded to fit inside crate or other item for travel. Outside total circumference is 24". Height is 8.5"
This 'no topple tote' (will not fall over when set down even when empty) provides 4 outer pockets, 12.5" wide on front & back, 5" on each side. Inside: durable nylon cordura fabric lining, 4 more pockets (2 full zippered pockets on the 12.5" sides & elastic closure pockets on each 5" side, perfect to hold that water bottle or thermos!) Large center area holds all your other ringside needs and/or items for travel. Convenient adjustable shoulder strap and durable top zipper closure keeps all inside items protected. Total outer circumference of this great tote is 36". Bag height is 11 ¾". 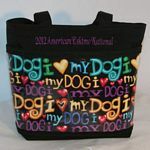 This 'no topple tote' (will not fall over when set down even when empty) provides 4 large outer pockets (11" front & back, 9" wide on each side) keep items at easy reach. Inside durable nylon cordura fabric lining with 4 more pockets (2 full zippered pockets on the 11" sides & elastic closure pockets on each 9" side, perfect to hold that water bottle or thermos!) Large center area holds all your ringside needs and/or items for travel. 2 -25" durable poly web straps allow for easy carriage. Outside 'D' rings on each end allow for addition of a shoulder strap making this a great travel tote for any occasion. Durable top zipper closure keeps all inside items protected. Total outer circumference of this great tote is 40". Bag height is 13.5. 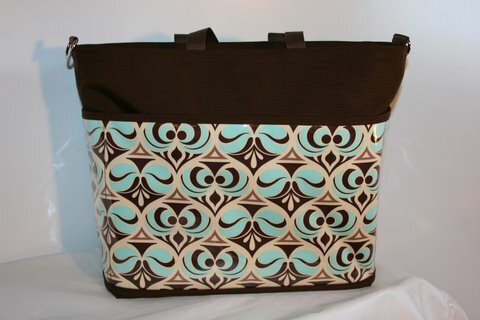 Great new style of tote similar in size to the LARGE TRAVEL TOTE, but narrower! However, it will still hold as much as the Large Travel Tote. Bag features durable nylon cordura fabric with outer vinyl covered pockets 15.5" wide front & back and 5.5" pockets on each side. Inside lighter cordura fabric lining with 2 full zippered pockets each 15.5" wide and 2 elastic side pockets, each 5.5" wide. Center open area is perfect for lap top computer or other similar items. Top zipper protects all items inside. Durable adjustable shoulder strap make this a great travel tote for any occasion. Total outer circumference of this great tote is 40". Bag height is 12". 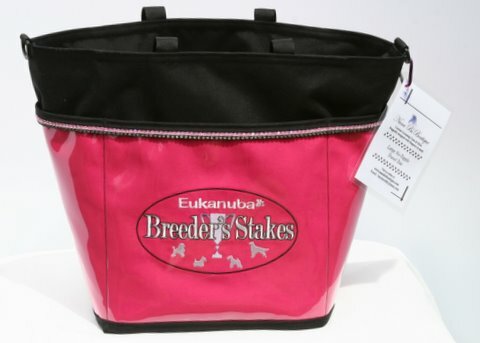 Basic MESSENGER TOTE is $115.00 Rhinestone Trim per row: $25.00 . Embroidery $20 per side. paw prints or other embroidery is additional. Photo Pockets: 25.00. For questions or to order: email Beccie@nanabsboutique.com.